During the hot summer days we rely on our AC to cool us down. 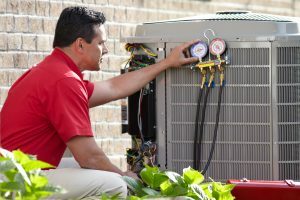 One of the most important things a homeowner can do is clean the outside AC unit. Over time dirt, leaves and grass clippings can accumulate on the outside of the unit. This build up impacts the system’s capacity. Prior to cleaning the unit shut the power off. Use a garden hose to gently clean the debris. Do not use a power washer and be extra careful not to damage the fins on the coil. Call us today to set up a time for our experienced professionals to maintain your AC.